Perpignan winger Julien Candelon has been given a six-week ban for a dangerous tackle on Northampton scrum-half Lee Dickson. 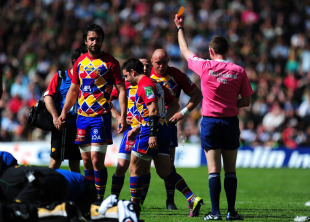 The incident took place in Saints' 23-7 victory in the Heineken Cup semi-final at stadium:mk on May 1. The offence was deemed to be in the mid range of severity and Candelon is free to resume playing from June 13. Meanwhile, Scottish centre Mark Bennett will move to Top 14 side Clermont Auvergne this summer. The 18-year-old made his professional debut for Glasgow Warriors in their Magners League loss at Leinster last weekend, but for now his future lies in France. "I owe a lot to the coaches who have helped me throughout my early career in Scotland as part of the development programme I have been part of," Bennett said. "It was a great feeling to make my professional debut with my local club, and I would have been happy to stay in Glasgow, but the opportunity to join Clermont is one I cannot turn down."